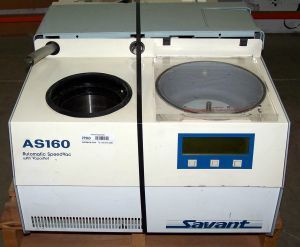 Product Description The Savant A160 centrifugal evaporator is a compact automatic system that saves space, time and labor when concentrating or drying moderate numbers of samples. Excellent for use with aqueous solvents, higher freezing point organic solvents, and mixtures (such as those used in drying synthetic oligonucleotides in ammonium hydroxide or in drying ethanol precipitates of DNA). The chamber accepts a wide range of accessory rotors (not included) that hold tubes from 0.4 to 16ml, or pooled sample volumes of 250ml. The unit includes built-in SVC100 concentrator, -60C (-76F) cold trap with 4L capacity and cartridge-type chemical trap. The external vacuum pump (113LPM) is a separate unit that can be either placed underneath the concentrator on bench or cart. Includes built-in trap. Rotor pictured is included - other rotors may be available. Vacuum pump is not included but may be available used from stock at additional cost. Why pay over $15,000 new?